It was not winter, but a cold reluctant spring and feisty April weather (I have been slow to draw this one). We splooshed about in a 6 degree Crummock Water whipped up to resemble the sea, all questions of ‘do we actually want to get in there’ vanishing with the chilly water’s embrace. Later, changing in the drizzle from cozzies into only marginally drier clothes, a dog-walker arrived at the gravely beach. As the small dog leapt about in the water yipping with delight and silliness, it’s owner sighed and told us “she goes in, even in the winter”, as if there was no explaining the antics of some creatures. “So do we”, we declared happily. 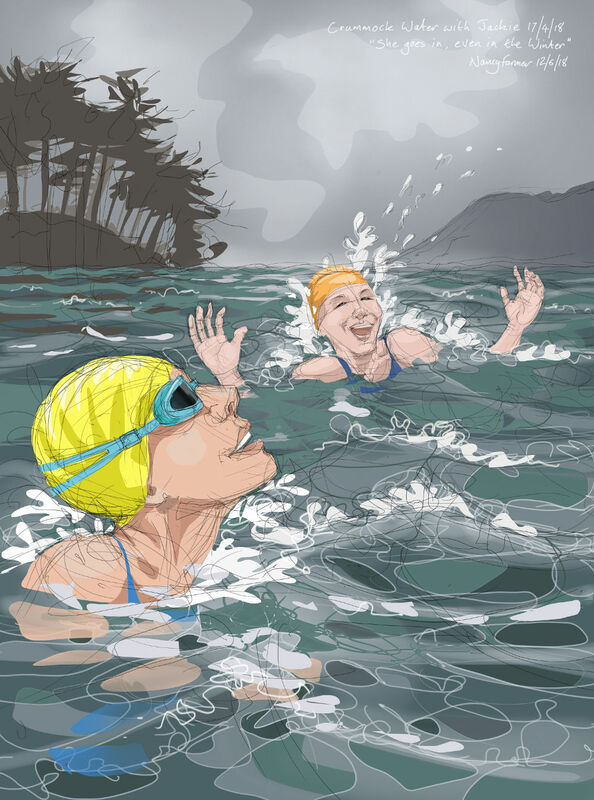 This entry was posted in digital, showcase, swimming and tagged art, cold water swimming, Cumbria, digital sketch, Lake District, swimming, wild swimming on June 12, 2018 by Nancy Farmer.